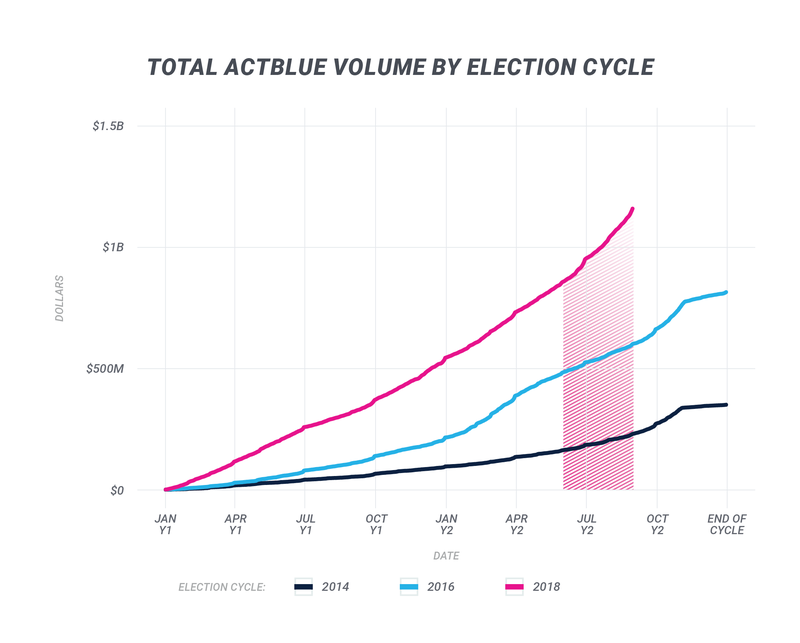 Coming off of a historic midterm, small-dollar donors, campaigns, and organizations made Q1 2019 the strongest start to an election cycle in ActBlue’s lifetime. This start is especially noteworthy when you compare the numbers from this past quarter to the exceptional numbers from just two years ago, when the resistance and huge surge of first-time candidates began to emerge and fuel unprecedented grassroots participation. As the numbers show, this movement has only deepened: 6,217 groups raised money through ActBlue in Q1 ‘19, more than twice as many groups raising during the incredible first quarter of the 2018 cycle. And small-dollar donors gave $174,506,038 through ActBlue to their favorite candidates and causes — by far the most dollars raised in any first quarter of an election cycle in our history. It’s clear the energy and action from small-dollar donors we saw during the 2018 election is here to stay. August wrapped up an unparalleled summer, with the small-dollar donor movement breaking multiple fundraising records from beginning to end. 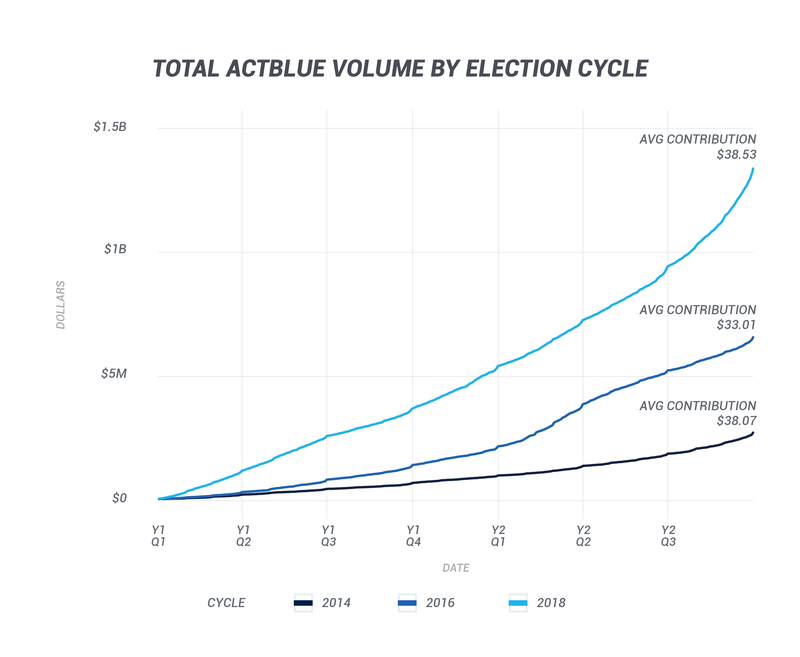 Grassroots donors started the month off strong by hitting a huge milestone on August 2nd: $1 billion raised on ActBlue in the 2018 election cycle! By the end of the month, small-dollar donors gave over $117 million (compared to $40 million in August ‘16) and made over 2.6 million contributions to 7,567 candidates, organizations, and nonprofits. This astounding level of participation not only made August our first $100 million month, but also our biggest month ever in terms of dollar volume and number of contributions. So just how big was this summer? Our three biggest months ever in terms of volume are now June, July, and August of 2018. This is especially astounding because summer tends to be a relatively slow time for fundraising, even in an election year, as you can see in the graph below. So far in the 2018 election cycle small-dollar donors have raised nearly double the amount they had raised at the same point in the 2016 cycle, with an average contribution size of just $35. The huge totals from this election cycle so far are a testament to the collective energy coming from the left to get Democrats into office this November. Check out all the highlights from August below. The number of campaigns and organizations using our platform to raise money from small-dollar donors more than doubled from August 2016, reaching 7,567 groups this August! We’ve seen an outpouring of new candidates and organizations as people decide to change our country and run for office themselves. August ‘18 also saw a big increase in the number of contributions when compared to August 2014 and 2016. Small-dollar donors are excited to be taking an active part in our democracy this year and are making more contributions than ever to a larger and more diverse set of campaigns and organizations. 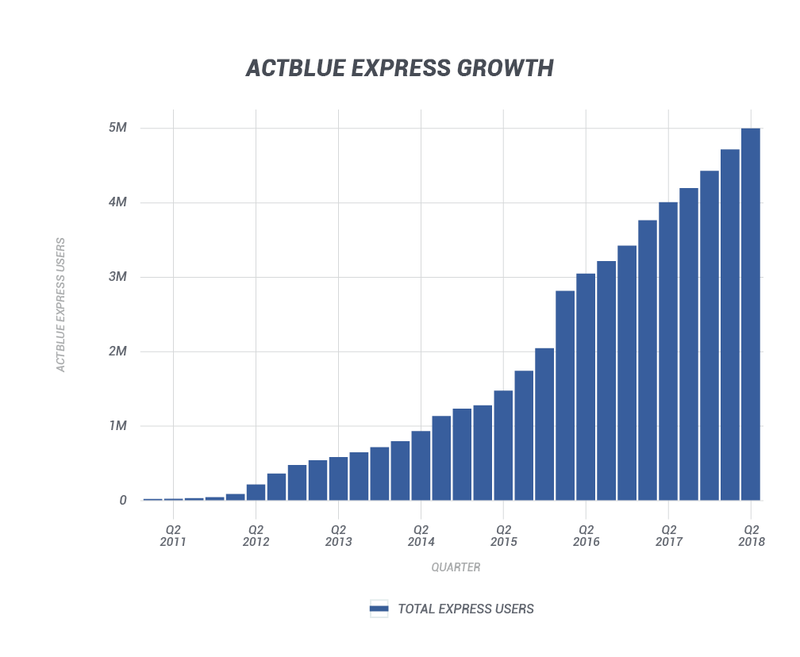 August was the biggest month in 2018 for new ActBlue Express users! The number of donors choosing to join ActBlue Express keeps growing, with an incredible 149,979 people signing up in August. These donors are able to save their payment information with us and give with a single click to any group using ActBlue. As small-dollar donors feel the urgency of the midterms and want to stand up to Republicans bankrolled by mega-donors, they are looking to make multiple donations to Democrats with fewer clicks. Mobile contributions made up 45.8% of all contributions on ActBlue last month. Mobile giving continues to steadily make up almost half of all giving on our platform, especially as more rapid-fire news churns out leading up to the elections. That’s why we make sure our contribution forms are easy to give through on desktop and mobile interfaces so donors can participate wherever they are located. 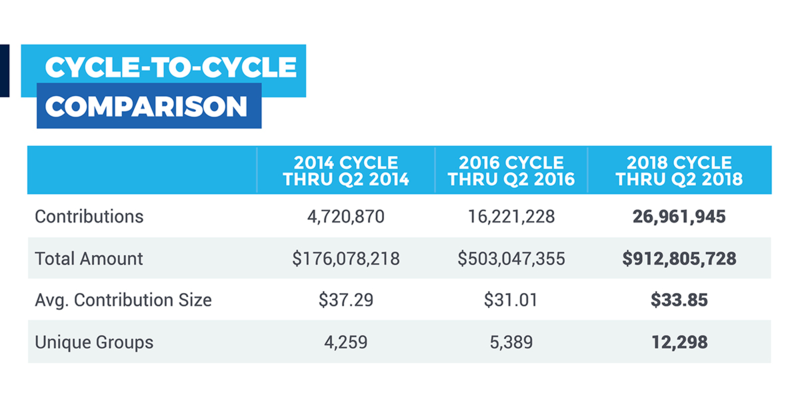 Recurring donations totalled over $19.5 million this August, more than double the volume in August 2016. With the midterm elections just around the corner, grassroots donors are meeting the call to mobilize and backing candidates on the left with people-powered campaigns. We’ve never seen a summer of giving like this past one. Small-dollar donors are building and growing a movement to turn Congress, state houses, and city councils blue this November. With primary elections quickly coming to an end and the anticipation of midterms reaching a high, grassroots donors aren’t showing any signs of stopping. If you want help fundraising for your favorite candidate or if you have questions about this post, get in touch with us at info@actblue.com. And if you’re looking to set up an ActBlue account for your group, contact support@actblue.com! As of today, small-dollar donors have raised $100 million on ActBlue in August alone, making it the biggest month in our history!! This milestone comes on the heels of an absolutely incredible summer for the small-dollar donor movement — June, July, and August of this year are now the top three biggest months we’ve ever had on the platform. For comparison, we handled about $40 million in August 2016 during the height of the presidential election. 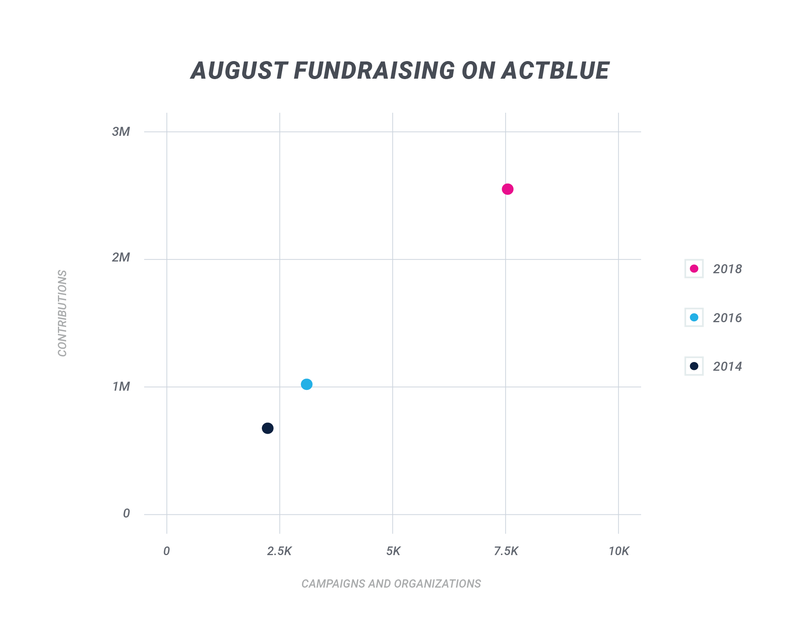 This is ActBlue’s first $100 million month, and we’ve seen 2.2 million grassroots supporters donate to 7,350 different campaigns and organizations across the country so far this August. Below you can check out how August 2018 stacks up against the other biggest months. The summer of small-dollar donors continued in July as folks across the country ramped up their organizing for the midterms. Grassroots donors on ActBlue raised $83,743,916 for 7,229 candidates, organizations, and nonprofits — $50 million more than was raised in July 2016 during a presidential year! This is especially impressive because giving typically slows during the summer. 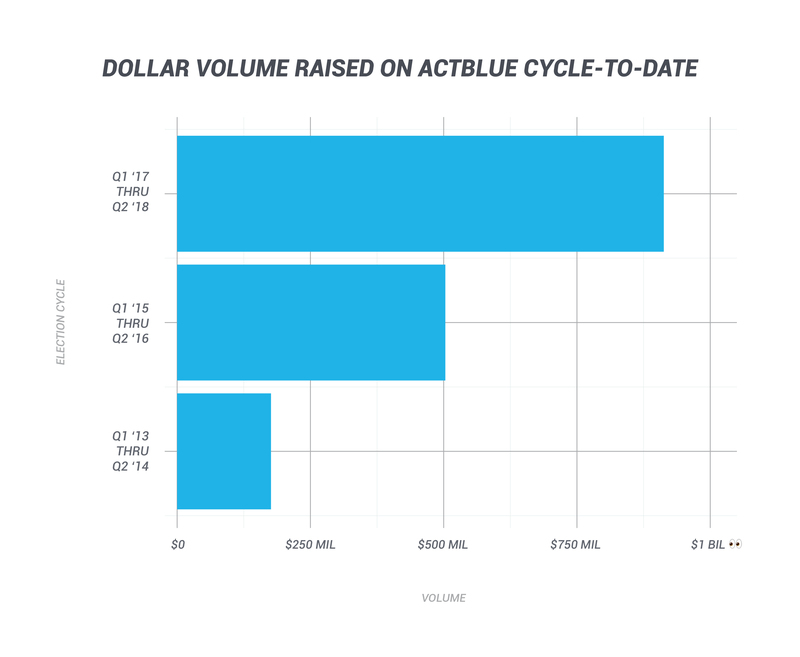 Small-dollar donors are clearly more motivated than ever, and all of their energy last month led to an incredible milestone on August 1: $1 BILLION raised by small-dollar donors using ActBlue so far in the 2018 election cycle! For comparison, $781 million was raised on ActBlue over the entire 2016 presidential election cycle. A big reason why we were able to reach this milestone is all of the new donors who are excited to get Democrats elected to Congress in November and make change in their communities. 59.3% of all people who have given on ActBlue since January 1, 2017 are first-time givers. 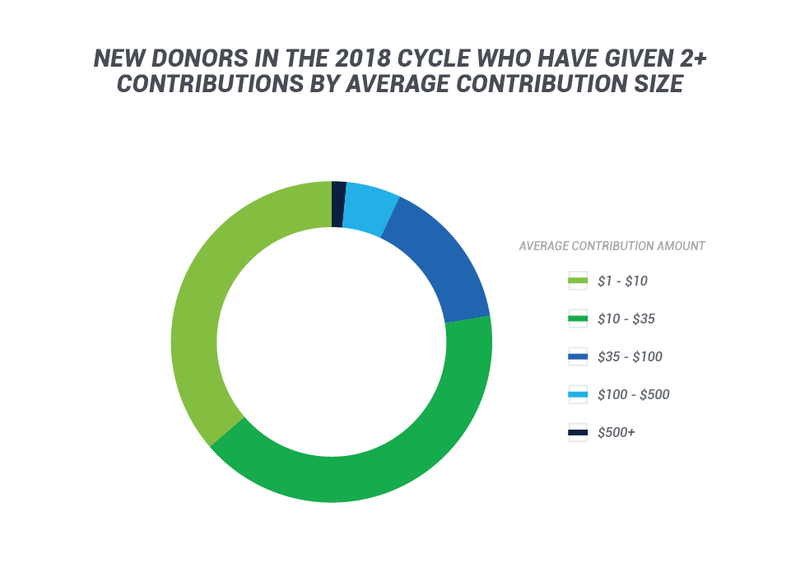 We took a closer look and found that 77.6% of new donors this election cycle who have given twice or more have an average contribution size of $35 or less! People are truly embracing small-dollar donations as a way to fight back and make their voices heard, just in time for the midterms. Check out all of the highlights from July below. Grassroots donors made 2,083,356 contributions in July, more than double what was made in July 2016! The number of groups using our tools also more than doubled from 2016. Nearly half of the groups using our tools last month were state-level campaigns, which is incredibly exciting. State legislatures have passed some of the most conservative policies at the state level and are in control of redistricting for Congress, making it essential for Democrats to win back state houses in November if we want to make long-term change. Many folks were moved to give when Trump announced Brett Kavanaugh’s nomination to the Supreme Court at 9 p.m. ET on July 9. 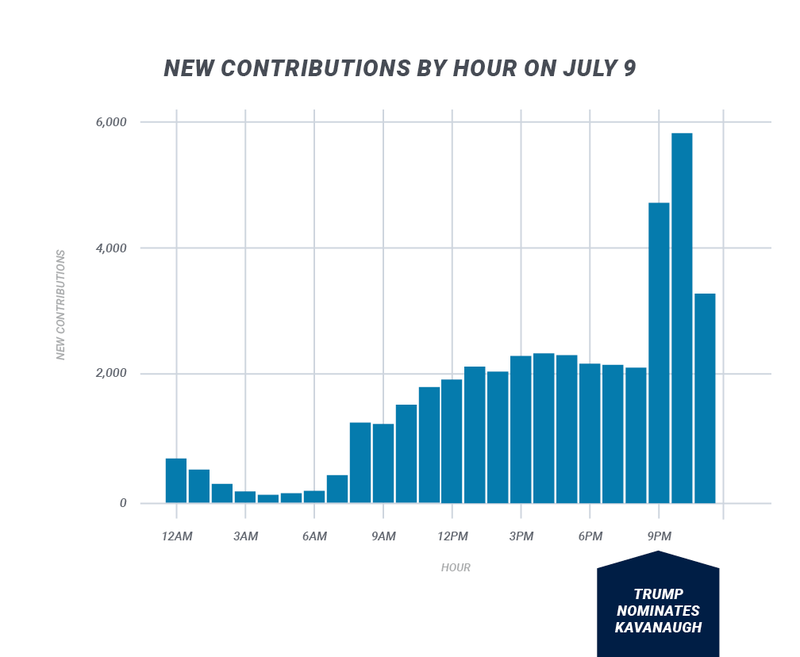 We saw contributions more than double in the hours after the announcement. Online grassroots donations give people a positive way to channel their frustrations and combat feelings of helplessness in situations like this. 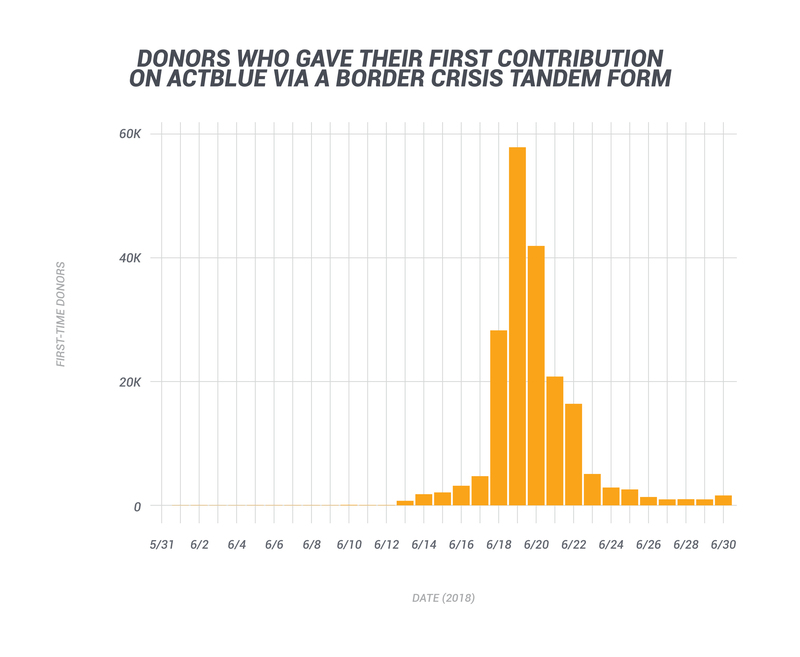 The ActBlue Express universe of donors continues to grow as more people realize the power of small-dollar donations and want to give multiple times. 117,781 people signed up for ActBlue Express in July, and 64.4% of all contributions came from ActBlue Express users! 45.2% of all contributions in July were made on mobile, up from 38.2% in 2016. Fundraising programs that don’t prioritize mobile giving will miss out on a lot of money. That’s why all ActBlue contribution forms are automatically optimized for mobile. Donors can give just as easily from their phone at the beach as they can from their laptop in the air conditioning. Monthly donations allow campaigns to plan for the future. Democrats are in a strong position going into the fall as recurring donations totaled $18,038,185 on ActBlue in July, nearly double the recurring volume in 2016. That’s a whole lot of money for knocking on doors and get-out-the-vote efforts! Grassroots donors are donating at unprecedented rates and making it possible for Democrats to get their message in front of more voters ahead of November. With only 89 days until Election Day, this participation and energy is really making a blue wave possible and laying a foundation for long-term change. If you have questions about this post or want help fundraising, get in touch with us at info@actblue.com!